Entries tagged with “Greg Campbell”. 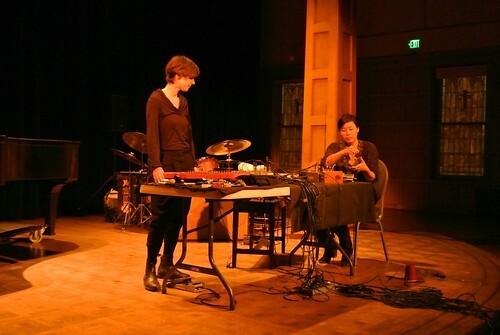 Last night was the final night of the 29th edition of the Seattle Improvised Music Festival at the Chapel Performance Space in the Wallingford neighborhood of Seattle WA. 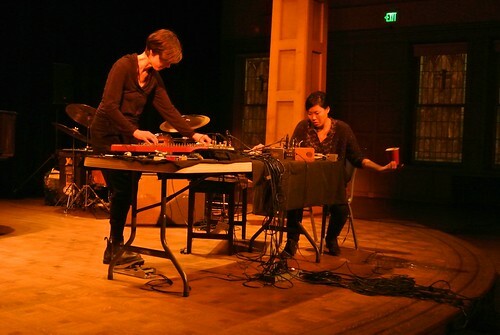 I headed to Wallingford earlier than I did yesterday as recent Vancouver transplant Joda Clémant had come down to see the Bonnie Jones/Andrea Neumann duo again (and planned to followed them Dead-Head style to Portland). Snow had been threatening all day and it was a cold, bleak trip featuring missed busses and other low comedy. I met up with Joda at the Chapel and as we walked the couple of blocks to 45th where the restaurants and such are a very light snow began to fall. After vegetarian Thai and beers in Wallingford we returned to the venue and it had clearly snowed throughout dinner and we were trudging through a half inch or so with no sign of the snow ceasing. We made it to seats at the front left about two minutes before the first set. The duo of Bonnie Jones and Andrea Neumann was what I (and Joda for that matter) were there to see. Happily they’d placed them in the lead off position which means they would a) have an actual soundcheck and b) I’d be able to take off at any point afterwards as I knew the snow was going to mess things up. As I noted yesterday I’ve seen Andrea and Bonnie in various combinations but had only heard their duo from their CD green just as I could see on Erstwhile Records. They were setup on a single table Bonnie with her collection of electronics and various objects at the end of the table stage left. Behind the table on the stage right end Andrea was setup with her autoharp, mixer, preparations and other electronics and objects. There was short introductions and then they came out to play. The set began with Bonnie picking up pedals and connecting them together while Andrea sorted through her preparations and began to work the autoharp. What followed was a engaging approximately thirty minute continuous improvisation. It was quite a diverse set that flowed though a variety of techniques and approaches to the duo’s instruments revealing a wide array of interpenetrating sounds. Andrea early on used eBow on the strings of the zither creating a very pure tone, agited the strings with little metal mallets creating a wash of sounds which she then muted with a rubber object (looked like a sandpaper holder but could be ink printing related), brought out a fan which she hovered over the strings exciting the pickups, a return to the eBow toward the end and even some plucked out notes. Bonnie as noted began with putting her kit together in a deliberate, sound generating fashion eventually moving on to manipulating her open circuits. In front of their table was red plastic keg cup which turned out to have a speaker in it, which Bonnie picked up and manipulated during the set. At one point she picked up her little singing bowls and bells and dropped them on the floor, picking them up and dropping them again. 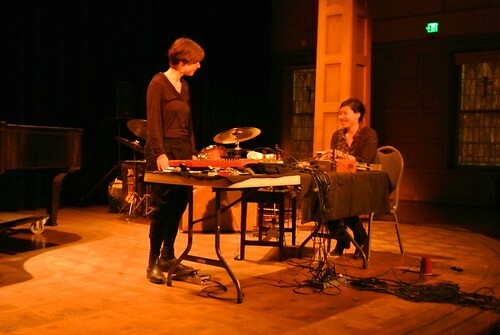 She also did further percussive work with the cable ends that she uses on the exposed circuits of her pedals. Later in the set she moved the cup out into the audience and returned to more aggressive static outbursts from the pedals now emerging from the speakers behind the duo and the cup out among the seats. Two times during the set she played vocal samples, the first of what sounded like a teenage girl recounting something like a dream or from a diary or perhaps a report to an authority figure; flat, unaffected and tense. The second was much more heavily processed and it was a choir, or chanting but with enough reverb and echo and maybe multracked that it was more of a wash. This more solemn sample was playing at the end which was a sort of deconstruction with Bonnie vigorously moving things about and Andrea creating a more wall of sound with feedback and such. A strong ending with the contrast between this seemingly less focused playing and this created sound with it’s pointing toward the profound. A really excellent set all around and I’m really glad I braved the weather to see it. In many ways these two work with sounds that have become quite standard material in this particular tiny corner of the improv world. Many of the techniques and processes used could be heavily associated with various musicians and isolated moments would be difficult to ascribe to a particular individual. But it just goes to show that what this music is about is not actually the material, it is the intentionality behind these sounds, the choices that are made, both beforehand and in the moment. There is an understanding of structure, that even if little of that is worked out beforehand, but that intuitively knows that you can move between events in a certain way, relaying upon a compatible partner to do the same and that it is the interpenetration of this disparate events, that are assembled in the heads of the audience that really creates the music. It had continued to snow and I’d planned to just head out after the duo but based on the previous night I knew there would be another set without much of a break and then a short intermission before the third. So I figured I’d just check out the second group and head out at the break. Less disruptive and I could make farewells on my way out. 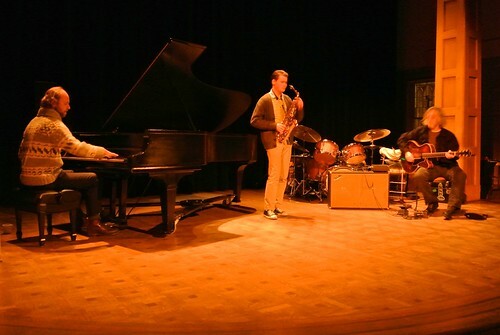 So this set was guitar/alto sax/piano (respectively) and was much more free improv of the the older school. Based on Joe’s performance the day before this wasn’t a surprise and while Gust often works in more experimental areas I’ve seen him several times in these more traditional free improv type ensembles. Jacob Zimmerman was new to me but apparently he is a local boy having come from Seattle Garfield High which is famous for it’s jazz programs. I really don’t have the vocabulary to talk about this kind of music – it really has never been my thing and while I’ve seen a number of examples I don’t really have much to say about it. It went on way to long – five individual pieces adding up to nearly an hour of performance. Which is quite unheard of at these shows – last night for instance all three sets was about an hour and half. The most interesting playing was from Gust I thought who generally does a kind Cecil Taylor-ish type playing in these settings. But quite often tonight he would play super quietly which at least the first time he did it brought the playing of his compatriots way down, becoming much softer and less aggressive. But overall with the length and such I found this set tiring and so headed home afterwards missing the third set of Matt Ingalls, Greg Campbell and Paul Kikuchi. 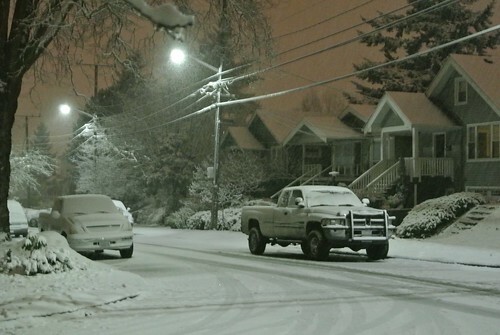 There was a pretty good spread of snow out there now, perhaps as much as two inches. I talked a bit with Joda at the entrance to the Chapel and it turned out that the venue that Bonnie and Andrea were going to play in Portland had suffered from burst pipes and the show was canceled. They were looking to line up a house show or something, but from what I’ve seen PDX seems pretty shutdown. Eventually I made my farewells and walked to the bus. The bus kept being delayed (I could see this on the fantastic One Bus Away app) so I kept walking between stops. Eventually I was at a stop in the U-District where I had a couple of options to catch busses up Capitol Hill and I just waited it out. Eventually got on one that made it about 2/3rds of the way up the hill and then encountered a virtual bus graveyard – a steep section that had buses parked all along it and toward the top a jackknifed bus completely blocking the road. Ended up walking home from there on the icy roads. Lot’s of walking in the cold and snow but I think it was all worth it. A Spiral Cage is powered by	WordPress 4.6.14 and delivered to you in 0.315 seconds using 22 queries.